I’ve been a Twitter user for quite a while now and have to say I do think its a great invention. I mainly use it for fun, but do follow people related to the IT world, and as I travel frequently, follow an awful lot of the travel update feeds. Yesterday it was a great little tool for showing just how strange things can get!! We had a very bizarre weather event here in Falmouth yesterday at about 5pm. The picture to the left shows what it looked like here from my house. Now considering its September and we have had one of the hottest summers for 7 years, you don’t expect to look out of your window and see the whole place white with cars struggling to get up the road! We’d had a severe weather warning put in place for heavy rain, but for 45 minutes we had one of the heaviest hail storms I have ever seen. Watching the roads get worse and cars struggling to get up the hill was getting a little concerning, considering our road can get busy (well busy for an estate road anyway!!). What did it for me was watching a 4×4 skid up the road from one side of the road to the other and almost hit a car that had stopped as it couldn’t get any further up the hill. I said to my wife, I think I will tweet BBC Travel South West (@BBCTravelSW) about this. BBC Travel South West is fantastic and I always look at the updates from them on Twitter before I do a long journey. I tweeted them with the picture above telling them where it was and how bad it was. Within a few minutes, they had re-tweeted, and they have one or two followers! I also follow a local weather feed as well, Kernow & Channel Islands Weather (@kernowweather – http://cciweather.co.uk). As they like to know about strange weather events around Cornwall I tweeted them the picture. I didn’t think anything more about it until my phone started pinging off twitter notifications. There was certainly a fair amount of re-tweeting going on and I was glad people were enjoying the picture. Deciding to have an early night I was reading my book (yes the phone was on the bedside table) and Twitter started again. This time I was being tweeted by a Journalist from the BBC and from a newspaper in Devon asking if they could use the picture on their sites, feel free I said!! 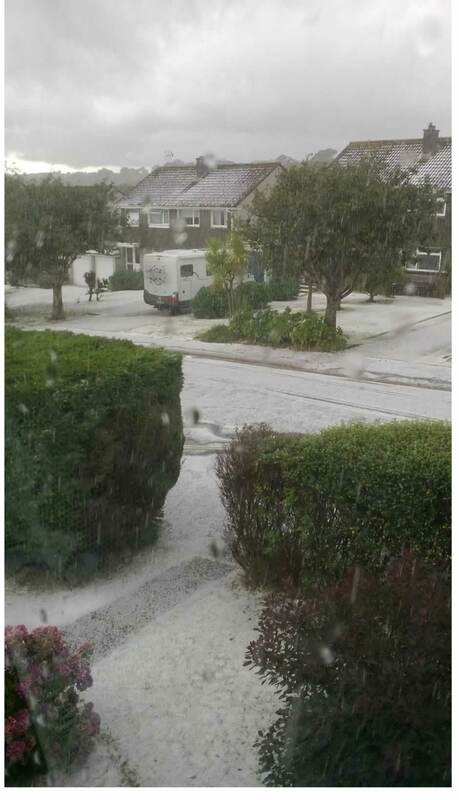 Kernow and Channel Islands Weather then tweeted back saying thanks for the picture and they have a full weather report on their site with my little snap of the hail. My wife then comes down this morning and says, “Is that your picture on the Western Morning News website?” (http://www.westernmorningnews.co.uk/) — Really?? Quick trip over to their website and yes, there it is with a report on the weather. Whats the big deal you posted a picture on Twitter! Yep, so what, its only a picture! My point here is that whilst Twitter has had a bit of a bashing one way or another in the news, its down to what you post for the world of Twitter to see. Whilst I only originally posted the picture to BBC Travel South West to let them know what was happening in Falmouth at the time, to give warning to people travelling or wanting to travel in the Falmouth direction, judging by some of the tweets I’ve had back people have enjoyed seeing the picture and a couple of the news papers seem to like it too. This kind of freak weather event doesn’t happen very often and its a great way to record and share it with others.